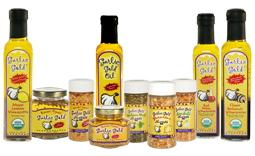 Season Greetings from Garlic Gold®! We’re looking forward to sitting down with family and enjoying a feast of recipes baked with our crunchy nuggets and oil. They’re the perfect secret ingredients, adding a certain je ne sais quoi to any dish on the table. Our stuffing recipe has plenty of moisture, light and fluffy in the middle and crispy on top. We add in shiitake mushrooms for their chewy texture and savory umami flavor. Use any bread you like — a mix of wheat and dark rye makes for a pretty color contrast, but sourdough is great too! 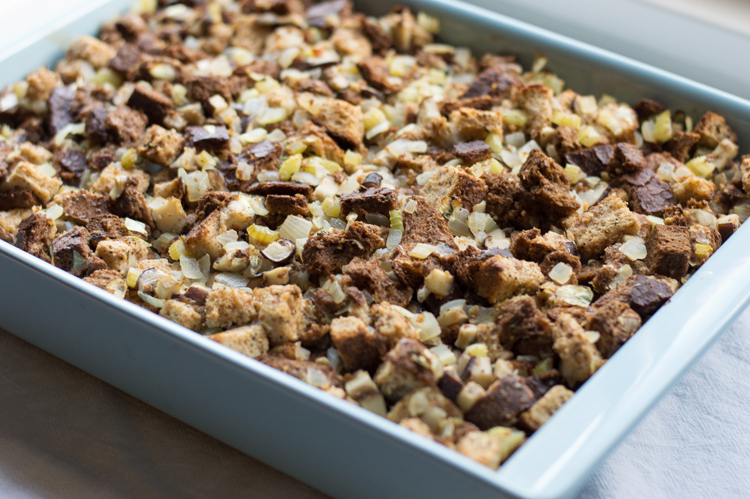 This adaptable recipe will become your new favorite holiday stuffing. Preheat oven to 300ºF. Spread out the cubed bread on a baking sheet, and toast for 15 minutes. Remove from oven and set aside to cool. Heat 1/4 cup of the Garlic Gold® Oil a large (12-inch) skillet over medium heat. Add the onions, celery, and mushrooms, then cover and let cook for 10 minutes, stirring once or twice during cooking. Stir in the thyme, sage, and pepper, then turn off the heat and set aside to cool. Turn up the oven to 375ºF. In a large mixing bowl, whisk together the eggs, broth, and Garlic Gold® Nuggets. Stir in the cooled vegetable mixture, then fold in the cubed bread. Drizzle the bottom of a 9-by-13-inch baking dish with two tablespoons of Garlic Gold® Oil, then spoon the stuffing into the dish, taking care not to pack it down. Drizzle the remaining two tablespoons of oil over the top, then cover the dish with aluminum foil. Bake, covered, for 30 minutes, then remove aluminum foil and bake for an additional 15 minutes, until crisp on top and cooked through. To check for doneness, insert an instant-read thermometer into the middle of the stuffing. If it registers at 165ºF or higher, it’s ready to serve! If you'd like to assemble the stuffing ahead of time, it can be refrigerated, unbaked, for up to two days. If you're baking it cold from the fridge, add an extra 10-15 minutes of baking time. Let’s see. We would add macaroni and chseee to that; broccoli casserole; and pecan pie. Katie has a really yummy raspberry jello salad that we like too. The menu staples appear each year, and then we throw in new things along the way! Katie has been our turkey maker too the way she does it is so so good and moist. Can you see, just have your sister in law share all of her family recipes. A true recipe for success!!! !